With the Oliviers almost upon us, and our friends across the pond wondering what James Corden has up his sleeve when he hosts the Tonys in June, it’s a good moment to look at awards ceremonies around the world. There’s been enough commemorative activity already in Britain, with London covered by the cheap and cheerful, but highly regarded, Critics’ Circle awards in January, and the glamorous Evening Standards back in November. And several of the awards given out around the country are gaining in reputation. The Manchester Theatre Awards, held in March, received a big turnout. This followed equally starry ceremonies for Wales and Ireland. The Scots have to wait until June for the Critics’ Awards for Theatre in Scotland. The 19th Irish Times Theatre Awards were notable for covering the whole of the island’s theatre. The big winner was Garry Hynes’ Galway production of DruidShakespeare, a version of four of the history plays that was also seen at New York’s Lincoln Center, but the Lyric Belfast figured strongly too. Prime Cut Productions, also Belfast-based, acquired the best new play award for Scorch, by Stacey Gregg. Not surprisingly, local awards are important to the rival theatre communities of Sydney and Melbourne. The former announced its 30 winners in January, chosen by a panel of 10 local critics. Belvoir Theatre pipped rivals Sydney Theatre Company to best mainstage production and best director for Eamon Flack’s Ivanov, ahead of Andrew Upton’s Endgame. The Royal Shakespeare Company’s Matilda was named best musical. Melbourne’s Green Room Awards, judged by several industry panels, were about to be announced as this article went to press. Nominations are in for a staggering 63 awards across nine categories, including dance, opera and cabaret, as well as several branches of theatre. Last year’s best musical award went to Once, with John Tiffany picking up best director. The national awards, the Helpmanns, are named in honour of Robert Helpmann and will be announced in July. Founded in 2001, they are now televised from Sydney Opera House each year. Last year, Belvoir Theatre’s Glass Menagerie won best production, with the revised version of Les Miserables taking the best musical award. We already know that Michael Lynch, late of the Southbank Centre in London, will be receiving a lifetime achievement award alongside the 2016 winners. The Brazilian Critics’ Association gives annual awards across the arts, with half a dozen categories for theatre. A closer equivalent to the Oliviers is the Shell Theatre Award, sponsored by the oil giant and given at around this time every year since 1988. The award, a statuette, is accompanied by a cheque for $2,000. It is given across 10 categories, including an outstanding achievement award, decided by a revolving panel of five critics and scholars. The most prestigious (and the most valuable) award in Canada is the Siminovich Prize, worth C$100,000 to its winner, who also gets to name a protege who in turn receives C$25,000. The awards operate on a three-year cycle with year one for a playwright, year two for a director and year three for a designer. The 2015 prize was awarded to designer Anick La Bissonniere and her protege Marilene Bastien last October. Toronto, Edmonton and Vancouver all have local awards. Toronto has the Dora Mavor Moore Awards, affectionately known as the Doras, which honour the creators of more than 200 theatre, dance and opera productions annually in 48 categories over six major divisions: general theatre, independent theatre, musical theatre, theatre for young audiences, dance and opera. The awards in each division are voted on by a jury of eight to 10 individuals drawn from the professional performing arts community. Each recipient receives a bronze statue cast from an original by Toronto sculptor John Romano. In the 2014/15 awards, the Canadian Stage production of Alecky Blythe’s London Road picked up six gongs in the musical theatre section, including best production and best director. The 2015/16 nominees will be announced in June. The country is sparing with its awards ceremonies – the next will not be until 2017. Then it will group together the winners of a number of prizes given by different organisations under the general heading of the Thalia Gala, which was televised when it started in 2010, but is not expected to reach the small screen in 2017. Prizes include the Thalia itself, the Lea for best play, and the Silmankaantaja for scenography. The Thalia and the Silmankaantaja are given by the Finnish Theatre Information Centre, based, in the case of Thalia, on a public vote. Others are given by respective peer groups: Lea by the Union of Playwrights, best actor by the Finnish Actors’ Union, best amateur company of the year by the Association of Amateur Theatres. The latest Lea, which is not for production but text, was given to Antti Hietala’s Ihanat Ihmiset (Wonderful People). Voting starts about now for the French theatre awards, the Molieres, which were created in 1987 by Georges Cravenne, who was also the creator of the Cesar Award for French cinema. Juries select shows in the award’s 19 categories, which are then voted on by an academy similar to that for the Oscars, composed of industry notables and critics. They are presented every June in a grand, televised ceremony, La Nuit des Molieres. Last year’s winners in the visual creation section were the British team behind the musical of Roman Polanski’s Dance of the Vampires: William Dudley (set), Sue Blane (costume) and Hugh Vanstone (lighting). The Mahindra Excellence in Theatre Awards have been in existence in India for more than a decade now – the 11th edition has recently taken place in Delhi. META invites entries from across the country, spanning different languages and genres; its only stipulation is that at least one showing of the play has taken place in the previous year. On average, META has been receiving more than 300 entries each year. 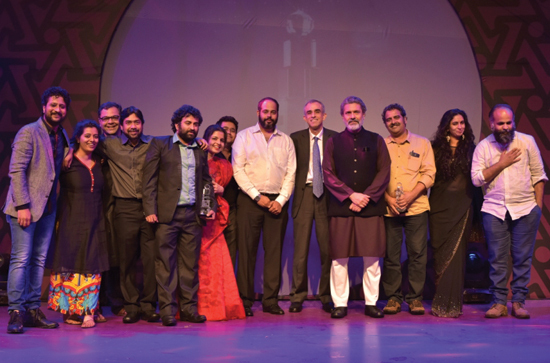 The plays are screened by a selection committee of five members and 10 shows are subsequently selected for the main festival and nominated in various categories. The selection committee comprises members with a substantial background in theatre. The 10 plays are then judged by experts in the field of the performing arts. META has its limitations. For instance, the selection committee is able to see only glimpses of the videos of the entries during five days. But in spite of its shortcomings, the festival has its heart in the right place and has come to be acknowledged as the only definitive theatre awards festival of its kind for theatre in the country. This year’s big winner, Mein Huun Yusuf Aur Yeh Hai Mera Bhai, gained four awards (best direction, best production, best lighting, best sound/music), and a jury special mention for best actor in a lead role (male). The Dong-A Theatre Awards, given by the newspaper of that name since 1954, are the leading awards in Korea. Their winners, in nine categories, are chosen by a committee of directors, critics and playwrights, and receive cash prizes as well as the traditional statuettes. Best production in this January’s ceremony was The Orphan of Zhao by Ji Jungxian, adapted and directed by Koh Seon-Woong for the National Theatre of Korea. The major Dutch theatre awards are headed by four acting awards: the Louis d’Or for best actor; the Theo d’Or for best actress; the Colombina for best supporting actress; and the Arlecchino for best supporting actor. Louis and Theo d’Or do not refer to the coin of Louis XIV but to the famous Dutch actor Louis Bouwmeester and his equally famous sister, the actor Theo Mann-Bouwmeester. Each of these four takes the form of a medal, designed in 1978 by the artist Eric Claus. They have been given, since 1955, by the Vereniging van Schouwburg en Concertgebouw Directies (the Association of Municipal Theatres and Concert Hall Boards), whose managing board makes the selections in conjunction with the yearly Dutch Theatre Festival, where the most notable productions of the previous season are shown. 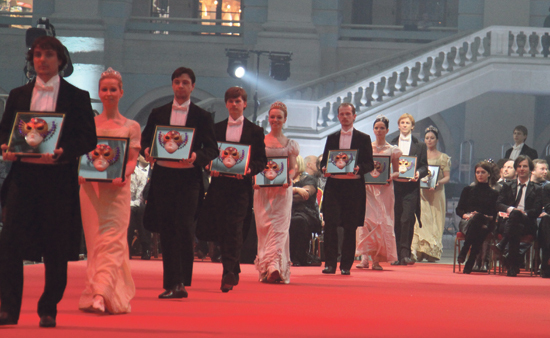 The festival takes place every September in the opening weeks of the new season. The ceremony is held on the last day of that festival, at a gala in the Municipal Theatre in Amsterdam. In the past decades, more awards and prizes have been founded (for example for musicals). For professional actors, however, the Louis and Theo d’Or are at the top of the hierarchy. First and foremost, the actors themselves regard this prize as the highest recognition for their work by a professional jury. Secondly, the value for companies and actors themselves is big: they are able to use them in publicity material (“winner of the Louis d’Or 2012”) – and they can make use of them in negotiating salaries. The Golden Mask is Russia’s national theatre award, established in 1993 by the Theatre Union of the Russian Federation. It is given to productions in all genres of performance: drama, opera, ballet, modern dance, operetta, musicals and puppet theatre. It is the driving force of a huge, all-Russian theatre festival that takes place in Moscow in the spring of each year, presenting the most significant premieres of the previous season. Both are supported by the Theatre Union of the Russian Federation, the Ministry of Culture of the Russian Federation and the Moscow government. The main festival programme includes productions selected by two boards of experts (one for drama and one for musical theatre) and nominated for the Golden Mask award. During the festival, two juries composed of actors, directors, conductors, choreographers and theatre critics make decisions about the final winners. The winners for 2014/15 will be known soon, as the present Golden Mask is on now. Last year’s opera winners included Purcell’s The Indian Queen, in a production for the Opera and Ballet Theatre, and Perm, directed by Peter Sellars, who was also named best director. Additional research by Tamara Arapova, Jeremy Eccles, Silvana Garcia, Lucia van Heteren, Yun-Cheol Kim, Matti Linnavuori, Deepa Punjani and Don Rubin.